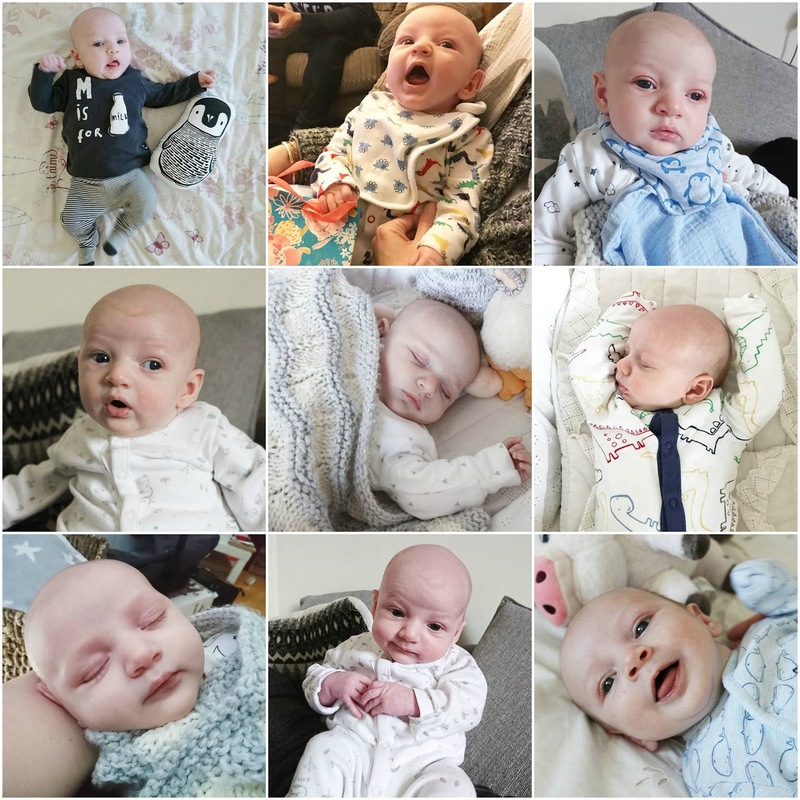 I can hardly believe I'm writing my little bubba's two month update but here we are. Joshua is now two months old, eight weeks or 62 days old. 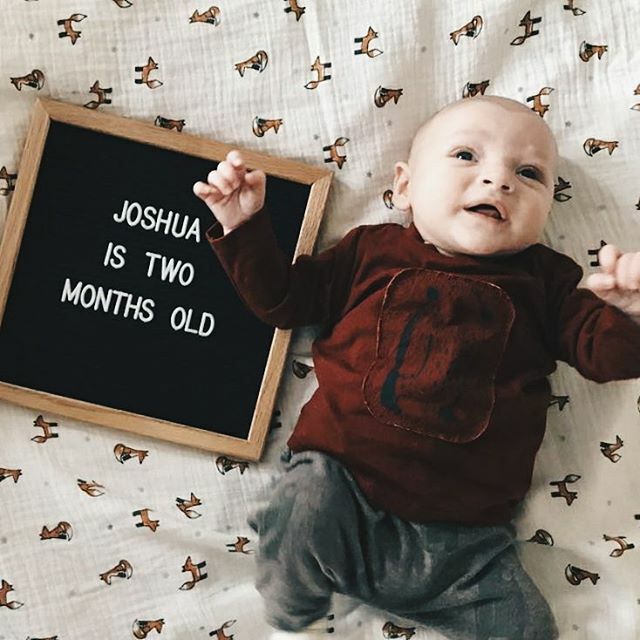 I was never sure if I would write these posts because I wasn't 100% on how much I would share when it came to Joshua but I want something to look back on, something I've written to remind me of my son growing up. Plus, you've all followed me throughout my pregnancy, these updates are a nice way to round things up. Joshua has changed so much, he's quickly finding his own personality and when he's not crying out because he's wet, again, he is the sweetest little boy. He's taken to formula really well, I'm still a bit sad that I couldn't breastfeed but I'm kinda over it now as it really doesn't matter how he's fed as long as he is fed. We've also found a new favourite new product in the Mam bottles as he feeds with them so well. So well that our gorgeous little chunk is now 12lb 11oz. We've seen both the doctor and the health visitor for our six week checks and they're both so happy with how he's doing, everything is as it should be with absolutely no complaints or worries. I am one happy Mum. We did have his eight week jabs on Friday though which was so hard for me, and for him. The minute that first injection went into his tiny little thigh he screamed and screamed so the two injections following that were absolutely horrible. I'm so glad I took my mum with me! He's been really good since his jabs, he was only up once for a feed both nights and only just hit a temperature. He just wanted lots of extra cuddles which I was more than happy with. Talking of sleep, we've had it pretty easy so far. He even allowed us eight hours last week. He tends to go down for five or six hours before he needs a quick feed and then he'll go back down for another three. He naps well in the day too which has meant I've been able to get on with blogging, house work and day to day life. I get that it won't always be this way but we're enjoying it while it lasts. Everyone is so quick to tell you how bad it can be but for us, our newborn stage has actually been a piece of piss. Joshua has found his fists the last week and is on a mission to shove the whole thing in his mouth. When he isn't trying to do that he's grabbing my hair, his muslin or most recently a makeup brush which I didn't think was meant to happen for weeks yet. He's also been rolling over, we thought the very first time was a fluke but he's done it a number of times since and every time he pushes his legs down I panic, thankfully he has pretty impressive head control! He has also started blowing raspberries which Arran is very happy about. Typical man. As I finish writing this, he is laid in Arran's arms snoring with his mouth hanging open but it is the most adorable sight in the world. Who knew something so small could completely steal your heart. How is he so big already??? Such a stunner, and he is so much like you! Such a sweetie! My 4 month old niece has taken to those Mam bottles as well she loves them and the teats are just right for her as well. I can’t believe how strong their necks are for saying everyone says you should support the head so much from birth! He is gorgeous! Wow and 8 hours! Great to hear an update! Nice to hear he's doing so well. I can't believe he is already two months! It seems like you're all doing so well. All of the photos are so adorable I can't cope! Two months already - that’s gone so fast!! Have an amazing Christmas together! I can't believe he's already two months!! Wow that has gone fast! It feels like only a week or two ago we were all wondering when he’d arrive!